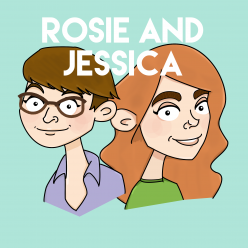 In episode 51, Rosie and Jessica are celebrating three years of sororal broadcasting with a fortnight of having done almost nothing, except pick up some new, quite bad television. Then they bring you their Top 5 Sisters, including quite a lot of nuns in a particular order (Holy Orders.) Then Jessica reels off pi for a bit. Happy Birthday! Jessica asks us Oh What Have You Done by Twisted Wheel and Rosie answers, I Feel Love with Donna Summer. You can hear further discussion of Timmy Time in Episode 25: Cradock and Barrington. Jessica is having a palaver with the Terrific Tea Cosy by Martin Storey. Unbelievable noises emanating from a human in this Les Mis blooper. A weasel riding a woodpecker.